Mattresses are very large and take up huge amounts of space in landfills. They cannot be compressed because the metal springs are very hard on landfill equipment. Mattresses have a compaction rate 400% less than regular garbage. Many mattresses are incinerated, which is an attractive technological option, but emits harmful pollutants into the air. Mattresses can take decades to decompose, causing additional strain on landfills. Recycling your mattress with Re-Matt means minimizing these environmental consequences and gives your mattress’ materials a second life! Re-Matt is always working to promote mattress recycling, divert discarded mattresses from landfills and reduce illegal mattress dumping. Where can I drop off/ recycle my mattress? The Re-Matt warehouse and head office is located at 3234 9th Street SE in Calgary, Alberta. We are next-door to Sherwin Williams Automotive Finishes. Re-Matt is open from Monday to Friday, 7:30 AM to 3:30 PM. Mattresses can be dropped off anytime between those hours. Call us to see about our Saturday options. How much do you charge to recycle my mattress? The Re-Matt recycle fee is $20 +GST per mattress for our residential customers. This price is per unit (per mattress or per box-spring). We ask our commercial customers to contact us for pricing as this depends on volume and pick-up capabilities. Do you charge extra to recycle a king size mattresses or box spring? We charge by the piece, which means our price is the same for every size of mattress. However, if a king size box spring is in two pieces, we will charge for each piece. How much of my mattress is being recycled? Almost all! We recycle between 95-100% of every mattress we receive. How do you dismantle my mattress? 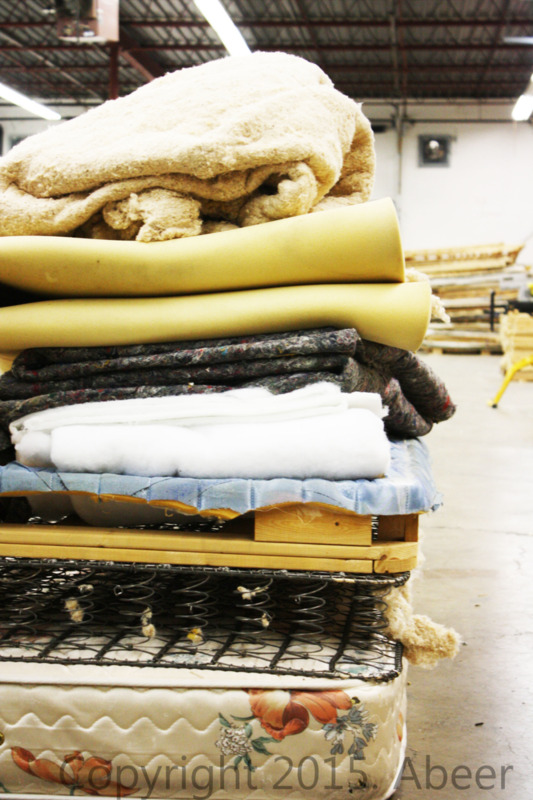 At Re-Matt, we utilize a deconstruction process that separates all the materials contained in mattresses and box springs. We dismantle each mattress by hand so we can maximize the amount of recyclable material we extract. What is in a mattress? Every mattress is made a bit differently, depending on the manufacturer. Generally, each mattress contains steel springs, foam, wood, felt and cotton. Check out Re-Matt's Mattress Facts page here. What do you do with the mattress materials? Re-Matt finds a home for almost all of the materials, post mattress deconstruction. We support Alberta local businesses by sending these raw materials to local manufacturers. Re-Matt is the sole provider of mattress recycling services in Alberta. Before Re-Matt, there were no other ways to recycle mattresses in this province and all used mattresses would end up in landfills. Thankfully, Re-Matt is ready to offer an alternative to this environmentally damaging issue. Where do your mattresses come from? Re-Matt is set-up to accept and recycle mattresses from the general public, transfer stations, landfills, hotels, retailers, universities, hospitals, and industrial camps. Will you recycle my futon? Yes, Re-Matt can recycle futons. Do you pick up old mattresses? Yes!! We now offer pick-up for both our commercial and residential customers. For commercial customers with large volumes of mattress, please contact us directly for transportation costs. For residential customers, the pick-up fee is $100.00 for 1 piece-2 pieces $115.00. Please add additional $10.00 per king size mattress if indoor removal is required. How does Re-Matt benefit the community? Re-Matt diverts tons of materials from local landfills and finds a new life for old mattresses. Re-Matt supports Alberta local businesses by sending our raw materials to local manufacturers. Re-Matt works with community programs like Prospect, employing individuals that strive to be contributors to our company and the City of Calgary.